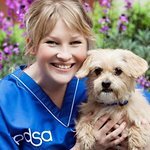 The PDSA (People’s Dispensary for Sick Animals) is the UK’s leading veterinary charity, caring for the pets of people in need. It provides free veterinary treatment to more than 4,650 sick and injured animals every working day and it promotes responsible pet ownership. We don't have any videos related to PDSA.